Masterful WebEx presentations – Part 2. In Part 1 of our series on Masterful WebEx presentations, you learned about interactive tools that lock in audience engagement, how to build slide - decks for virtual (not face-to-face) audiences, and how to plan for the size of your audience. Now, the day of your presentation has arrived and it’s time to focus… on delivery. Here are four critical tips to make it flow oh-so-smoothly. 1. Assume your audience knows nothing about using WebEx. Imagine your audience has just been released after 25 years from a Siberian gulag. The first place they’re headed? YOUR WebEx presentation. They need general introductions and an overview on what to expect for the next hour. But most of all, they need explicit instruction on using interactive tools. As we learned in the last post, interactive tools are the key to audience interaction. And an interactive audience is an engaged audience. Your instruction should be both visual and verbal. Show them with screen captures or pictures (see slide below) and tell them verbally how to use those tools. Whatever tools you expect your audience to use: chat, Q&A, polls, or whiteboarding, give them a tour of them before you begin. Then, remind them again where the tool lives when you get to that part of the presentation. 2. Fill in the dead air. Visually and verbally. There is nothing that screams amateur more than long, confusing, bouts of silence. You’re opening up a poll, switching to application sharing, asking for feedback. Any transition offers the risk that your audience will dive straight into their email. How to solve this? The screen should always tell your audience what is going on. And at the same time, verbally remind the audience what is happening. Seeing and hearing the message at the same time will help even the most ADHD-prone audience member know what is going on. The two slides below show how to keep everyone in the moment. 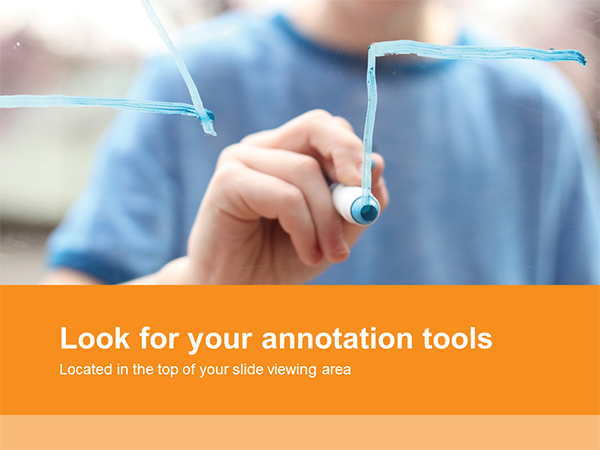 The majority of interactive tools live in the annotation toolbar. Just before you begin, make sure it is enabled otherwise you will find yourself panicking. And remember to turn off whatever tools you won’t be using to avoid confusion. Feeling more advanced? Turn tools on or off as you are calling on the audience to use them. You never know when a rogue participant will try and graffiti your elegant slide deck with the highlighter tool! Simply put: engage them with what you choose and eliminate the rest. Producers are your stage crew. They take control of behind-the-scenes mechanics so that you can focus on helping your audience absorb your content. Our rule of thumb? You should even consider using a producer for audiences of over 25. If you are conducting a highly interactive meeting or training (say with breakout sessions) with 25 people – having backup will relieve mountains of stress. 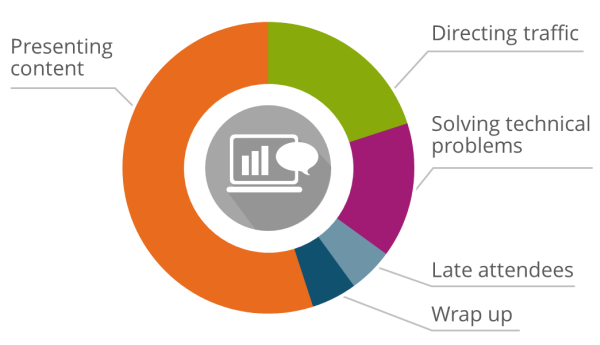 Even more -, for web meetings conducted globally, producers can provide a localized experience for participants in different regions. They can translate content into different languages through chat or Q&A. Look out for Part 3 of Masterful WebEx Presentations: Collecting the customer data your WebEx left behind. If you find our blog helpful, be sure to check out Web Conferencing Strategies & Training – resources for helping - companies save money and speed up the time it takes to get training to market. For more virtual meeting tips and best practices, check out TPC's Successful Online Presentations workshop.